Lakers guard Lonzo Ball will miss at least one more week of action with his sprained ankle, the team announced on Thursday. Ball underwent additional examination this week, with team physicians determining that he’ll need more rest due to a bone bruise related to the ankle injury. He’s missed the team’s last 14 games, with the Lakers holding a 5-9 record during that stretch. The Lakers are currently three games behind the No. 8 seed Clippers with 21 contests remaining. Los Angeles has often looked to veteran point guard Rajon Rondo in Ball’s absence, but the team’s need for another ball-handler has been clear over the past month. Suns forward Josh Jackson was fined $20K by the organization today, according to Gina Mizell of The Athletic (Twitter link). Jackson failed to show up at a team meet-and-greet autograph session on Wednesday, causing the team to discipline him for his actions. Veteran forward Corey Brewer appears to have found a home with the Kings, with the 32-year-old explaining that Sacramento is his top option right now. “This is option No. 1 right now,” Brewer said, as relayed by Jason Anderson of the Sacramento Bee. “I like it here. I love it here. I’m having a great time.” Brewer signed a rest-of-season contract with the Kings today after inking a pair of 10-day deals. Despite having a focus on their long-term future, the Hawks plan to be aggressive with top-tier free agents during the 2019 offseason, Sam Amick of The Athletic writes. Atlanta currently sports a young core headlined by Trae Young and John Collins, a pairing that could intrigue star free agents. Players such as Kevin Durant, Kawhi Leonard, Jimmy Butler, Klay Thompson, Khris Middleton and DeMarcus Cousins are set to reach free agency on July 1, with each name a potential target for the youthful Hawks. Atlanta holds the fourth-worst record in the Eastern Conference at 21-41, but the team will have roughly $41MM in cap space to work with this summer. As Amick notes, the franchise is armed with a promising young nucleus, a new head coach (Lloyd Pierce), and an upgraded arena and practice facility as it seeks meetings with some of the top available names on the market. The Hawks have Dewayne Dedmon, Vince Carter and Justin Anderson as players who will become free agents this summer. Forward Kent Bazemore holds a player option for the 2019/20 season worth $19.2MM. Former first-round pick Royce White still plans to play in Ice Cube’s BIG3 basketball league this summer despite making a jump to mixed martial arts, the 27-year-old told Hoops Rumors. White, who last played in the NBA with Sacramento in 2014, entered his name to the BIG3 player pool in early February. White first made his intentions of starting a career in MMA known during an interview with ESPN’s Greg Rosenstein. White released a book this week titled “MMA x NBA: A Critique of Modern Sport in America”. He was drafted 16th by the Rockets in 2012 after a standout season at Iowa State, later moving on to hold stints with the Kings and teams overseas before temporarily stepping away from the court last August. White, a 6-foot-8, 260-pound forward, joins Shannon Brown, Kendrick Perkins, Lamar Odom and other former NBA players who are set to play in the BIG3 this summer. Free agent Jordan Adams has been acquired by the Rio Grande Valley Vipers, G League affiliate of the Rockets, agent Shasta Scott told Hoops Rumors. Adams appeared in 32 games with the Grizzlies from 2014-16, averaging 3.2 points per game in limited time. He was drafted with the No. 22 pick by Memphis in 2014. Former NBA player Spencer Hawes has signed a contract in the NBA G League and is available to be claimed off waivers, Adam Johnson of 2 Ways & 10 Days tweets. Hawes, a 10-year NBA veteran, has made stops with the Kings, Sixers, Cavaliers, Clippers, Hornets and Bucks during his professional career. Jeff Withey has agreed to a deal with Greek team Lavrio B.C. for the rest of the season, the team announced (hat tip to Sportando). Withey started the season in Turkey with Tofas Bursa, but left the team following their elimination in the EuroCup. He last played in the NBA with the Mavericks during the 2017-18 season. The Bulls and veteran center Robin Lopez won’t agree to a buyout before Friday’s deadline, K.C. Johnson of the Chicago Tribune writes. Players currently on NBA teams must be waived by the end of March 1 to be playoff-eligible, with Lopez opting to stay with the Bulls (17-45). Bulls coach Jim Boylen said a buyout between Lopez and team management was never discussed, though clubs such as the Warriors reportedly had interest in the two-way big man leading up to the Feb. 7 trade deadline. Lopez, 30, has averaged 7.9 points, 3.1 rebounds and 18.9 minutes in 54 games with Chicago this season, starting in 16 contests. He made past stops with the Suns, Hornets, Blazers and Knicks before joining the Bulls in 2016. Chicago explored trading Lopez earlier this month, but opted to keep him and send away young forwards Jabari Parker and Bobby Portis in a deal with Washington instead. Marvin Bagley III left the court on Wednesday night with an injury to his left knee, which is the same one that kept him sidelined for roughly a month earlier this season. The 2018 No. 2 overall pick was showing promising signs coming out of the All-Star break, scoring 20.3 points per game while adding 10.5 rebounds, 1.0 steals, and 1.3 blocks per contest over that stretch. With Bagley set to miss at least a week or two, the Kings will be forced to reshuffle their rotation and the biggest winner could be Harry Giles. Giles saw 18 minutes on Wednesday versus the Bucks, accumulating 18 points, seven rebounds and one block while making 9-of-13 looks from the field. 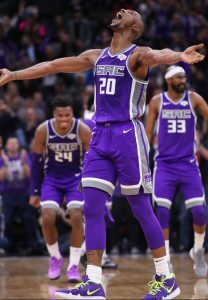 He played many of his minutes at the four spot when Bagley was sidelined this winter and on Friday, Sacramento will take on the Clippers—a team that has been the fourth-most fantasy-friendly to opposing power forwards this season. While Giles should be a profitable low-cost option in daily fantasy this weekend, I wouldn’t necessarily add the second-year big man in season-long leagues until we see exactly what coach Dave Joerger is going to do with the rotation. If you have the roster space, he makes for a nice speculative add, as has the potential to be a fantasy playoff difference-maker if he gets enough run. The Sixers are without Joel Embiid and Boban Marjanovic, leaving Jonah Bolden to get the starting nod against the Thunder tonight. OKC has been an above-average fantasy matchup vs. opposing centers this season, per HTB. Philadelphia will play the Warriors on Saturday, a team that ranks in the bottom 10 this season vs. the position, so keep an eye on Bolden should Embiid miss that contest. Domantas Sabonis will miss nearly a week with an ankle injury and Myles Turner and Kyle O’Quinn will both benefit. However, over the next two games, the Pacers take on the Timberwolves and Magic, a pair of teams that have been among the top-10 stingiest matchups this season in terms of fantasy production. Dewayne Dedmon ranks eighth overall in ESPN’s Player Rater over the last 15 days. Dedmon has become very Paul Millsap-like this season, contributing in many categories. Over that 15-day stretch, he’s averaging a solid 13.8 points and 7.6 rebounds while adding 2.0 assists. Dedmon is just one of four players (Brook Lopez, DeMarcus Cousins, and Turner) to average two blocks, one steal and one 3-pointer made during that stretch. The Hawks center should be owned in season-long leagues. Hassan Whiteside‘s hip issues caused him to miss the Heat’s tilt with the Warriors on Wednesday and he’s not expected to play against the Rockets tonight either. Bam Adebayo should be owned in all leagues and he’s a nice DFS play tonight. If Mitchell Robinson is somehow still available in your league, go and scoop him up. The Knicks rookie should also be owned in all leagues. Fantasy questions? Take to the comment section below or tweet me at @CW_Crouse. Missed an earlier edition of Fantasy Hoops? Check out the entire series here. 3:58pm: Brewer’s new deal with the Kings will be worth $2MM, per Shams Charania of The Athletic, who notes that the club had competition to keep the veteran today (Twitter links). That means that Sacramento is using its room exception to lock up Brewer, rather than just doing a minimum salary deal. 2:16pm: The Kings have made it official, announcing Brewer’s new rest-of-season deal in a press release. 1:10pm: The Kings plan on signing veteran swingman Corey Brewer to a rest-of-season contract, reports James Ham of NBC Sports California (Twitter link). Brewer’s second 10-day deal with Sacramento expired overnight, so he’s technically a free agent until he inks a new deal with the Kings. Brewer, who appeared in seven games on a pair of 10-day contracts for the Sixers earlier this year, didn’t play during his first 10 days with Sacramento. However, he has emerged as a rotation piece during the Kings’ last few contests, averaging 16.3 MPG in three games, including 20 minutes during Wednesday’s loss to Milwaukee. Brewer averaged 8.3 PPG on .444/.364/.714 shooting in those games. As a strong defender and high-energy player, Brewer has fit in nicely for the Kings, who traded away a pair of small forwards at the deadline, in Iman Shumpert and Justin Jackson. Harrison Barnes has assumed most of those newly-opened minutes, but the club has found playing time for Brewer recently too. No corresponding roster move will be required to re-add Brewer, whose signing will give the Kings 14 players on NBA contracts. That leaves one open roster spot if the team wants to add any reinforcements during its playoff push. If he signs today, Brewer’s new contract would carry a cap hit of about $359K, assuming it’s worth the minimum. After watching Marvin Bagley III leave Wednesday’s game with a left knee injury, the Kings got some good news on Thursday. According to the team, an MRI didn’t show any major damage to Bagley’s knee, confirming the original diagnoses of a sprain. The rookie big man will be re-evaluated in about a week or two, per the announcement. Bagley, who will turn 20 in March, has enjoyed a successful rookie year so far, averaging 13.9 PPG, 7.2 RPG, and 1.0 BPG in 47 games (24.8 MPG). The former Duke star has played some of his best ball this month — in the five games before his injury, he was averaging 23.0 PPG and 9.0 RPG with a shooting line of .534/.444/.767. While the Kings will miss Bagley during their playoff push, today’s announcement suggests that he could return in mid-March for the final month of the regular season. As long as he’s on the shelf, Willie Cauley-Stein, Nemanja Bjelica, and Harry Giles are among the players who could be leaned on more heavily. Kosta Koufos is also a candidate to re-enter the rotation, as he did during Bagley’s absence earlier in the season. The Kings have an open spot on their roster which could be used to add another frontcourt player for depth, but I wouldn’t expect the team to rush out and make a move. The trajectory of Karl-Anthony Towns‘ 2018/19 season significantly changed when the Timberwolves finally found a taker for Jimmy Butler, sending him to Philadelphia in November. 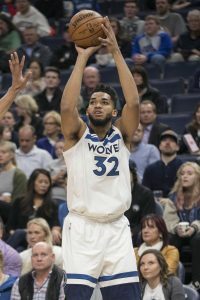 Prior to that trade, Towns had been just okay by his standards, averaging 19.9 PPG and 10.8 RPG on 45.9% shooting in 13 contests. Since Butler’s departure, the former No. 1 overall pick has boosted those averages to 24.6 PPG, 12.7 RPG, and a 53.3 FG% in 46 games. While Butler’s departure helped boost Towns’ numbers, it may be another player’s trade request that ultimately has a greater impact on the 23-year-old and his team, as Dane Moore of 1500 ESPN observed this week (via Twitter). When Towns signed a five-year, maximum-salary contract extension with Minnesota last fall, a decision Jon Krawczynski of The Athletic recently revisited and explored in more detail, the two sides agreed to a condition that will determine how much the deal is actually worth. If Towns earns a spot on an All-NBA team this spring, his new contract will have a starting salary worth 30% of the cap. If he doesn’t, his 2019/20 salary will be just 25% of the cap. As our early maximum salary projections for 2019/20 show, that difference projects to represent a gap of more than $5MM next season. Over the course of the five-year contract, Towns would earn a projected $189.66MM on a 30% max, as opposed to $158.05MM on a 25% max. For a Minnesota team that’s also on the hook to a long-term max contract for Andrew Wiggins, that difference isn’t insignificant — it could help determine whether or not the Wolves can make certain moves in the coming years. So what are the odds of Towns making an All-NBA team this season? Well, he’ll be considered a center, and there are two centers who look like locks to be named to All-NBA squads — Nikola Jokic has been an MVP candidate in Denver, and Joel Embiid has been the best player on a Sixers club that looks like a legit contender in the East. It’s hard to imagine a scenario in which Towns beats out either player for a spot on the First or Second All-NBA Team. Of course, there’s one more big man who would typically be a perennial lock for an All-NBA slot: Anthony Davis. That brings us back to AD’s trade request. Davis believes he should be considered the “best player in the league,” as he said on Wednesday night (link via Martin Rogers of USA Today), but the extent to which his public trade request has devastated the Pelicans won’t be lost on voters. Based on his pure numbers (27.5 PPG, 12.5 RPG, 4.1 APG, and 2.5 BPG), Davis obviously has a strong All-NBA case, but he’ll likely be blamed for the dysfunction in New Orleans and penalized accordingly for it. His minute restrictions down the stretch will reduce his overall numbers, and he’s unlikely to play more than 65 games. Plus, the Pelicans are on track to be a bottom-four team in the West. And on top of all that, some All-NBA voters may consider Davis a forward, which would split his votes between two positions. There are a lot of factors working against him earning one of the three center spots. It’s still possible that voters will name Davis to an All-NBA team, but I’m somewhat skeptical. And if AD doesn’t make it, that opens the door for another center to grab a Third Team spot. Towns would be a prime candidate for that slot, though he’d face stiff competition from Rudy Gobert and Nikola Vucevic, both of whom are having excellent seasons. Gobert’s impact on the defensive end of the court could give him a leg up on Towns, but only if All-NBA voters weigh his defensive contributions much more heavily than All-Star voters did — Gobert didn’t earn a spot on the Western Conference All-Star team this month. As for Vucevic, he isn’t scoring quite as much as Towns this season, but his numbers across the rest of the board match up pretty favorably with the Wolves’ young star. If Vucevic helps push the Magic into the postseason, perhaps he’d get the edge over Towns. If not, I could see voters being swayed by KAT’s more impressive scoring numbers. It remains to be seen whether Towns will ultimately be named an All-NBA player, but it’s a subplot worth watching the rest of the way, since voters will be making a $30MM+ decision. If KAT does earn a spot on an All-NBA roster, it wouldn’t be a surprise if Davis’ trade request indirectly helped get him there.